Meng Wanzhou steps out of her $4.2 million mansion, a GPS monitor strapped to her ankle, and slips into a chauffeured black SUV. Then she's off, largely free to roam the shops and restaurants within 100 square miles of Vancouver until her 11 p.m. curfew. So goes another day of house arrest for Meng, chief financial officer of Huawei Technologies Co. and daughter of the billionaire founder of China's biggest telecom provider. It is, by all appearances, a comfortable life for someone at the center of a complex power game. Meng's arrest at the behest of the US - which wants to extradite her on grounds she tricked banks into potentially violating Iran sanctions - has sparked an unprecedented diplomatic row. Nine days after her Dec. 1 arrest during a stop over in Vancouver, China detained two Canadians on national security grounds. And this week, a China court imposed a death sentence, following a one-day trial, on a Canadian found guilty of drug smuggling. How Meng's case will be resolved remains unclear, though she's become an object of fascination in a city where her family owns two homes and where she spent down time when she wasn't running Huawei's finances. Tourists stop by to take selfies outside her home near a 2,000-acre park overlooking the Pacific Ocean, where she is ensconced with her husband and daughter. Meng's bail terms include the GPS monitor, an 11 p.m. to 6 a.m. curfew, and 24-hour surveillance by a private security firm, Lions Gate Risk Management Group. Their job is to ensure she doesn't violate the conditions of her release. She pays the hefty bill for that monitoring, which includes two guards at a time and a driver. 'If I were on The Price is Right, I'd say that's about $7,000 a day,' or more than $2.5 million a year, said Nicholas Casale, a former police detective, referencing the game show. Casale structured Bernie Madoff's bail agreement and acted as monitor for the disgraced money manager for about three months. Meng's long leash following her C$10 million ($7.5 million) bail is unusual, he said - normally, the defendant's movements and communications would be restricted. 'You can't just go to dinner or go shopping,' Casale said. The conditions of Meng's house arrest are in stark contrast to another corporate titan - former Nissan Motor Co. chairman Carlos Ghosn - who is confined at a Tokyo detention center. He arrived in handcuffs, plastic slippers and a rope around his waist in court last week. Meng is also faring better than the two Canadians detained in China, who have had scant consular access. That hasn't stopped China's envoy to Canada from protesting Meng's treatment. In a fiery op-ed published in an Ottawa newspaper last week, Ambassador Lu Shaye railed against 'Western egotism' and 'white supremacy' of those who have criticized China for detaining the Canadians, in what was widely seen as retaliation. 'Have they shown any concern or sympathy for Meng after she was illegally detained and deprived of freedom?,' Lu wrote in the Hill Times. Lu told reporters in Ottawa Thursday that Meng is innocent, adding the case is politically motivated. He also defended the detentions of Canadians, saying they weren't retaliatory. Meng, 46, sported a purple Hermes scarf and Bottega Veneta handbag when she first reported to her bail supervisor in Vancouver on Dec. 12. Renovations, meanwhile, are underway at her other C$16.3 million mansion in one of Vancouver's toniest neighborhoods, where a truck from a high-end closet designer was parked outside recently. Her defense indicated she'd like to move there when it's ready. If she does, she'll be two doors down from the U.S. consul general's residence, where the star-spangled banner flaps on the front lawn. Getting glimpses of her daily life is difficult - her guards appear to have taken on the responsibility of shielding her from the public eye. When Bloomberg News journalists parked on the street next to her home last week and identified themselves as press, one guard took photos of the license plate as another sped over in his white SUV to block their vehicle. 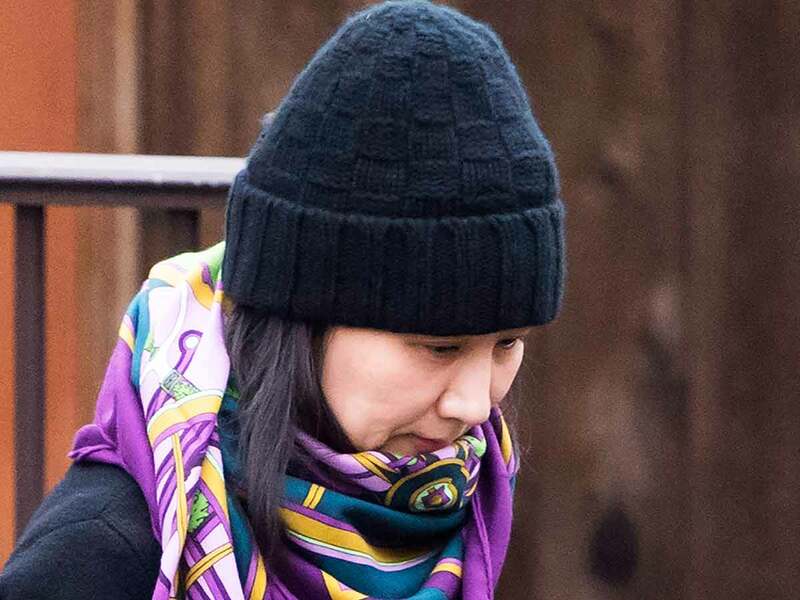 As Meng slipped out of her house in her Lululemon jacket, the guard began accusing the journalists of damaging his car before later acknowledging he'd obstructed them. Still, the outings and post-card views mask a darker reality for Meng: This extradition process could drag on for months and possibly years, if history is any guide. And the odds are high that she will be extradited in the end. The U.S. must turn over its formal extradition request by the end of January. It hasn't made the request yet, a justice department spokesman said in an email Thursday. Canada's Justice Minister David Lametti can reject the request or order extradition hearings to begin. It's not clear if that will happen before Meng's next court date in February. Lametti can't arbitrarily refuse. His ministry would have to determine that fraud doesn't constitute a crime in Canada - an implausible finding. Furthermore, in Canada, the extradition judge has to accept whatever evidence the U.S. presents at face value - the proceedings don't consider the strength of the evidence or the likelihood of conviction. Canadian judges end up approving about 90 percent of extradition requests because the system makes it nearly impossible to mount a defense, says Gary Botting, a Vancouver-based lawyer who's been involved in hundreds of extradition cases. 'They say 'Jump,' and Canada says 'How high?,'' he said. For her part, Meng has hinted at how she'd like to spend her time during what could be a years-long ordeal. She'd like to apply for a PhD in business administration at the University of British Columbia, whose campus sits near her home. In an awkward twist, the school is receiving C$3 million from Huawei to fund research on 5G - the next-generation mobile network technology that the U.S. wants to block the company from developing.